DC COPS GUN DOWN UNARMED BLACK WOMAN WITH BABY IN COLD BLOOD AFTER CRASHING HER CAR! TOP PARAGRAPHS KEPT UP TO DATE; MULTIPLE UPDATES AT END! KEEP SCROLLING! Well, the incendiary language coming out of the Democrats ("Politics have reached Civil War levels!" "Republicans are Terrorists!") was bound to rile somebody up. Looks like it might have been the DC Police and the Secret Service that got riled up, instead of the not-scary WWII Honor Vets that had Obama quaking in his flip-flops. Or, maybe it was the dental hygenist from Connecticut. In any case, bad things went down in DC today. 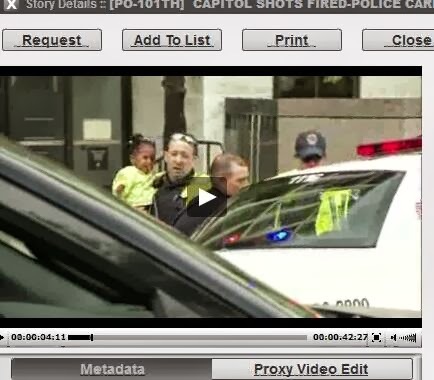 A 34-year-old black woman, Miriam Carey, with a 2-year-old baby girl, an unemployed dental hygenist of Somali descent from Stamford Connecticut, who had been hospitalized for depression, had some words with a Secret Service agent at the Treasury entrance. Who knows what she was doing there. She may have who mouthed off to the cops, or perhaps her adult passenger (where is he now?) did. Some say she tried to go through the security barrier, but I see no evidence of that on the front of her car. guns drawn, about 6 feet away. I figure the cops started yelling at the woman. They're already freaked out and hopped up, maybe by the 'riods they're probably taking, or maybe the Capital Shield 2014 drill that's going on. The woman maybe yelled incomprehensible things back at the cops. Typical auditory exclusion, no communication. About then, she freaked out, backed up and maybe T-boned a Capitol Police Car. Then, she shoved it into Drive and bolted. The woman bugging out made the cops go nuts, like hornets out of a nest. Maybe some idiot Secret Service agent that had his booger hook on the bang switch had a negligent discharge and shot at her, a sympathetic nerve reaction. Then, a bunch of the cops start shooting at the fleeing car, with complete disregard for what was behind it, or who was in it. One of the moron cops hit a "pop-up" stanchion barrier near First Street and Independence Avenue, upending his car, and freaking the other cops out even more. There may have been another stop here, as some outlets are reporting two 'crime scenes' (though we don't know that she wasn't just an innocent victim of government violence). in applauding the moron Capitol police. 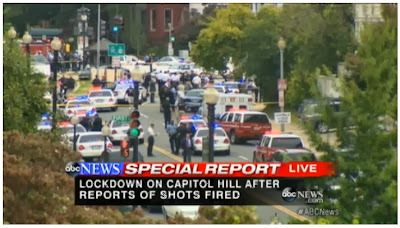 Meanwhile, the woman bolted, as 20+ Capitol Police cars picked up the chase. The Keystone Cops followed like maniacs, around and around the traffic circle, and then they maneuvered her into the Barrycades, and then gunned her down in cold blood. Nice work, Capitol Police and Secret Service. What a tragedy. Pretty hard to blame that on the TEA Party. Sounds more and more like the Keystone-Kops-type event in Miami in 1986, the shootout between the FBI and Platt & Mattix, except this woman wasn't shooting. It is a God's honest miracle that the little girl wasn't killed. That, and the fact that these Keystone Kops can't shoot worth a flip. And it looks like the woman didn't even have a gun. They are going to have to "snowflake" her, and drop an "unregistered weapon" in the car to make this look all better for Emperor Zero. And a copy of “The Turner Diaries.” You just wait until tonight. MSNBC and Piers Morgan on CNN will be caterwauling, "She had a GLOCK AK-15 AUTOMATIC SHOTGUN RIFLE PISTOL CARBINE OF DOOM! In a SACRED GUN FREE ZONE!" Turn the sound down so you won't be distracted by the yammering talking heads who know nothing at this point. There was a YouTube video, but it's been yanked. A wag on Free Republic quipped that they are clearing her history of Obama-supporting blogs, campaigning, etc. I would not be surprised one bit. 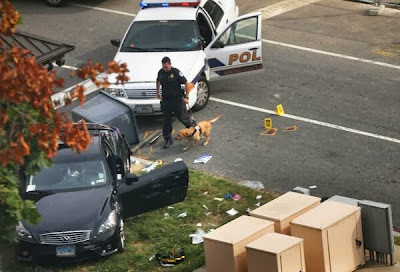 Media reports say that the incident started when a woman attempted to crash her car through the barriers in front of the White House along Pennsylvania Avenue. Shots were exchanged with police and a car chase took events to Capitol Hill. UPDATE: The cop crashed the Barrycade, and didn't get shot at all! Secret Service pursued a suspect from the White House to the Capitol. One agent in a marked Secret Service vehicle was injured when the car in which he was chasing the suspect was upended by one of the Capitol's electronic barricades as it rose out of the ground. A Capitol Police officer, who was initially reported shot, was later found to have also been injured in a traffic accident involving a moving barricade. UPDATE: Who knew THIS was going on? Capital Shield 2014 is a joint training exercise in the National Capital Region, or NCR, that runs from Sept. 30 thru Oct. 3. first responders to train in nation's capital. The drill is the event again? So, the cops were all jazzed up about this, and then shot some lady who was turning around? UPDATE from Free Republic: The little orphaned black girl. The poor thing. Lost her mommy now, as a result of a government hit job. There also appears to be a Capitol-area parking sticker on the windshield, so maybe she was a furloughed Obama minion. From a Tweet: "Female suspect has no ID on her http://abc7.la/1c9BFQ9 Vehicle leased with out of state tags"
UPDATE 6:05EDT: The DailyMail UK is saying she was a 34-year old dental hygenist from Stamford, Connecticut. Real dangerous, them terrorist hygenists. NY Post says the woman's name was Miriam Carey. UPDATE 6:22EDT: Looks like the police are already telling the media there was a "gunman". Bull crap. Those cops did all the shooting. Several people on Free Republic have been talking about the coincidence of Ms. Carey being of Somali descent, coupled with the fact that today's the 20th anniversary of Black Hawk Down (Mogadishu, Somalia), and add that the US-government-funded al Hurrah TV station just happening to be on the scene. Spooky, dudes. CYA maneuver. The FedGov has to find a way to explain why they gunned down a young mother in cold blood yesterday. Answer: say she's a kook who thought Obama was out to get her. Implying, she's just like all the other TEA Party kooks. They're saying it without coming out and saying it, by bringing Emperor Zero into it. Thursday's drama began around 2 p.m., when the woman steered a black Infiniti near the White House, a U.S. Secret Service source said. She drove up to a barrier at the 15th and E street checkpoint and was approached by Secret Service officers. She hurriedly made an erratic three-point turn, striking the barrier and backing into an officer before driving away, the source told CNN. 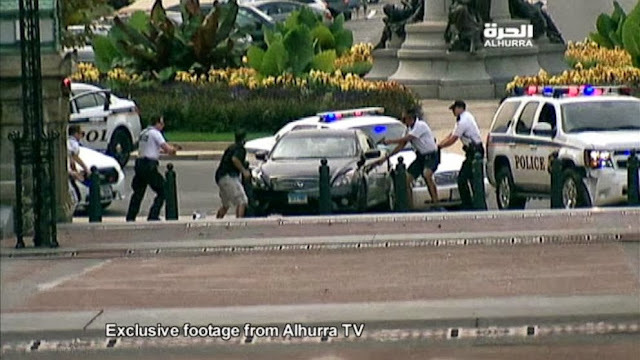 Dramatic video footage by a videographer for Alhurra TV... showed the black vehicle then speeding around a nearby traffic circle with a police car in close pursuit and then heading away. The car crashed into more security barriers a few blocks later, witnesses said. Yeah, buddy. I bet he was. NOT. “I thought it was a motorcade,” said Ryan Christiansen, of Idaho Falls, Idaho, when he saw the black car trailed by police cars with sirens wailing. Then, Christiansen said, the car “was pulling away, and somewhere between six and eight shots were fired,” he said. Map: See the scene of a car chase that began at the White House and ended in a shooting near the U.S. Capitol. And, they also can't come up with a reason WHY they shot her. How about you try it like this: Unidentified individual shot while attempting to escape police, causing damaged vehicles and two injuries. Take out Black. Take out Female. What do you have? Someone acting irresponsibly, and illegally was shot while breaking the law. Where's your sympathy there? It's gone. OR, try this: Female mother works at a prison, and is put on furlough because of the government shut down, and whlve visiting her sister in DC, takes her anger out on the town, and then realizes what she has done, freaks out, runs, sees cops shooting at her, and instead of doing the RIGHT thing: Stopping, she runs even faster. They shoot her, because we live in a world where unknown terrorists live right next door to us. We've had bombs, shootings, galore. We are not going to allow such a thing to happen on the streets surrounding the nation's entire government. Anyone who thought we would now has to rethink, don't they. She was probably just a hurt, confused, and maybe stupid woman, but she got what anyone would get in those same circumstances. Who was in the wrong? She was. When you act guilty, you will be treated as such when the possibility of danger is present. TeresaR: This is still America. The police have no business gunning down an unarmed woman because she "looks guilty" or "acts guilty". What bullcrap. And by the way, "the possibility of danger" is always present. When seconds count, the cops are minutes away. Arm yourself.